Looking down upon the night lights that illuminate the downtown region of Toronto, Ontario from the CN Tower. When you journey to the top of the CN Tower at night in the city of Toronto, Ontario, you can see lights for miles across the area. The lights on the tall skyscrapers mark the center of the downtown core of Toronto with highways and main streets encircling the region. Imagine what it would be like from the CN Tower if the city was blacked out. Downtown Toronto at night seen from CN Tower, Ontario, Canada, North America. 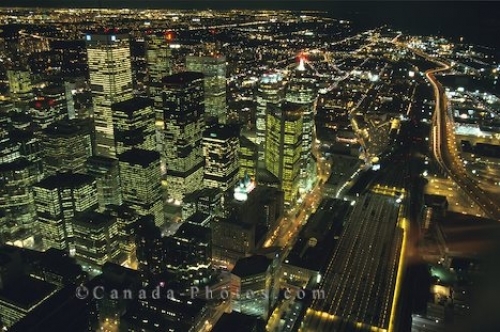 Picture of the night lights of the city of Toronto from the CN Tower in Toronto, Ontario in Canada.